How to cane chairs is one of the most satisfying of chair restoration projects. You can retrieve a sad chair from an attic or a yard sale, restore the finish, re-glue if necessary, and then weave in an all new cane chair seat. 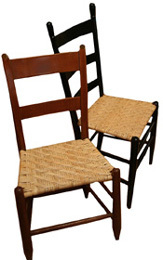 Shop for Chair Cane and Chair Cane Kits Here. It’s not difficult. It only takes a bit of patience. If you’re a do-it-yourself-type, you’ll love it. Our chair cane kits and chair cane booklets teach you how to cane chairs in no time at all. Chair cane is the bark of the tropical vine calamus rotang. It’s naturally strong and durable. No need for stain. Cane doesn’t absorb stain well. Instead the cane will develop a natural patina as it ages and darkens. Chair cane comes in many widths. Visiting our Choosing Your Supplies page if you’re not sure about whether this is the material for your chair. To determine which kind of cane seat you have, click here. To learn how to determine the size of chair cane needed for your seat, visit our Chair Cane page or Chair Cane Kits page. We have a chart with all sizes of chair cane. You select your chair cane size by measuring 1/ the size of the drilled hole, and 2/distance from the center of one drilled hole to the center of the next hole. Find these two numbers on the chart and you’ll know your chair cane size. Soon you’ll be saving chairs all over town. If you do it for hire, you’ll be needing our guide to how much to charge for Seat Weaving Labor. And then you’ll be teaching others how to cane chairs, and they’ll be saving chairs all over town. It’s a revolution! Our chair cane booklets, as shown above, has very detailed illustrations and step by step instructions. Visit our online store to shop for chair cane here.